The consumer finance (CF) market for Point of Sale (POS) loans, such as two-wheelers, and consumer durables are becoming saturated. There are some two or three CF companies jostling for customers at one retailer. The trend is to move from entry-level POS products to online and digital, such as secured/unsecured cash loans and credit cards. These products are expected to have a high growth potential, penetratingthe unbanked and lower-income segmentsas well as supporting financial inclusion at the lowest levels. Cash loan is an effective way to penetrate the 48 per cent of the population that are mass- and lower-mass income segments. The size of unsecured loans is usually from VNĐ1 million (US$43.67) to VNĐ10million and the turnaround period is 30 days, which amounts up to VNĐ70 million in three years, depending on the credit history. This way, CF companies can increase the volume of loans while quickly re-assessing, diversifying and managing their risks. Not only credit institutions but also fintech companies have stepped up to provide secured and unsecured cash loans, as fast and as conveniently as possible, via online and mobile channels.Examples include Doctor Dong, ATM Online and Cashwagon. The growing number of smartphone users in Việt Nam provides a large potential customer base for the online lenders, some of whom promise that borrowers do not even have to show up in person to apply or receive the disbursement. Other than straight-up cash loans, credit cards are used as a more sophisticated tool to support the demand for urgent cash. This is boosted by consumer behaviour, which is shifting towards cashless transactions and e-commerce, and improving infrastructure, as evident in the total number of POS machines and ATMs, which recorded a 10 per cent year-on-year growth in 2017. Moreover, the immediate process from loan application to disbursement via credit cardsincreases customer satisfaction. Regarding the issuers’ benefits, the credit card product readily offers a wealth of information, including customers’ identity information, credit history and consumption behaviour, as well as cuts down on time while streamlining costs. Thanks to the strong, aggressive growth of FE Credit, credit card products have taken up 2.8 per cent of the market share after just two years of introduction. The outstanding credit card loan balance in 2017 ranged from $60 to $200 per card among CF companies, indicating a strong demand of card holders for money to support immediate purchasing needs in place of cash loans. In a developing country such as Viet Nam with a burgeoning middle class, large unbanked population and climbing purchasing power, credit card productshave much room for growth. As of June 2018, three CF companies offer credit cards in Việt Nam JACCS, FE Credit and Home Credit. The country is a lucrative market for both existing and potential players. Supported by better internet and mobile infrastructure and encouragement from the government to transition to cashless transactions, credit card products are expected to continue its exponential growth from the current small base to become a main consumer finance product as seen in more developed countries. 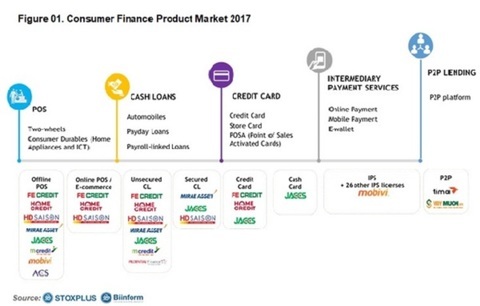 Within a more crowded market, although CF companies are still maintaining their hold on POS as entry products, the focus is now on growth segments, including credit cards and cash loans. The development of the CF market, therefore, not only supports macro-economic objectives by enabling access to finance and promoting cashless transactions but also deepens the CF penetration and enhances customer experiencevia more sophisticated and convenient products. More detailed information about the CF market and segments is available in our sixth comprehensive report,“Consumer Finance in Việt Nam,” featuring the most up-to-date information on CF companies as well as practical market trends and news to aid your decision-making. 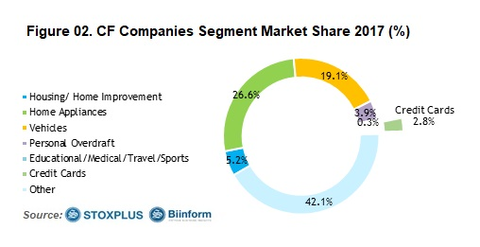 Please visit the website, https://biinform.com/Reports/1AC3-vietnam-consumer-finance-market-2018-report-8770.html, for more details.